Future changes in tree growth, associated with a warmer and drier climate, are predicted for many species and locations across the European Mediterranean Basin. 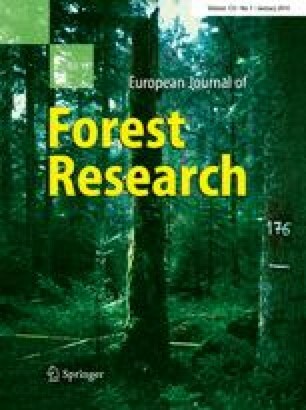 However, quantification of the intensity and severity of related consequences for forest ecosystem functioning and productivity remains challenging. Species-specific distribution limits that are particularly sensitive to small changes in the ambient climate may provide an ideal test bed to assess the nature of past growth trends and extremes and their responsible controls. Here, we seek to understand how twentieth century climate change affected the growth of European beech (Fagus sylvatica L.) nearby its south-eastern distribution limit in Albania and Macedonia on the Balkan Peninsula. We sampled 93 living trees from undisturbed mixed forest stands at ~1,450 m a.s.l. and 29 timbers from nearby historical buildings. Application of different tree-ring detrending techniques allowed robust composite chronologies with varying degrees of high- to low-frequency variability to be developed back to 1648 ad. Comparison with local meteorological station measurements and continental grid-box climate indices revealed spatiotemporal instability in growth–climate response patterns. Nevertheless, year-to-year and decadal-long fluctuations in radial beech growth were significantly (P < 0.001) negatively correlated at −0.61 with June–September temperature over the 1951–1995 period. This (inverse) relationship between increased beech growth and decreased summer temperature is somewhat indicative for the importance of plant-available soil moisture, which likely controls ring width formation near the species-specific south-eastern distribution limit. Significant positive correlations between beech growth and drought (scPDSI; r = 0.57) confirm metabolistic drought constraints. However, an unexpected late twentieth century growth increase not only contradicts the previously observed growth dependency to summer soil moisture, but also denies any putative drought-induced forest ecosystem suppression in this part of the Mediterranean Basin. We are thankful to K.-F. Rittershofer and P. Lera for logistical coordination and support in the field. Our thanks also go to J. Weishampel and H.-P. Kahle for their helpful comments and suggestions. The study was supported by the German Research Foundation (project #SP 437/16-1).